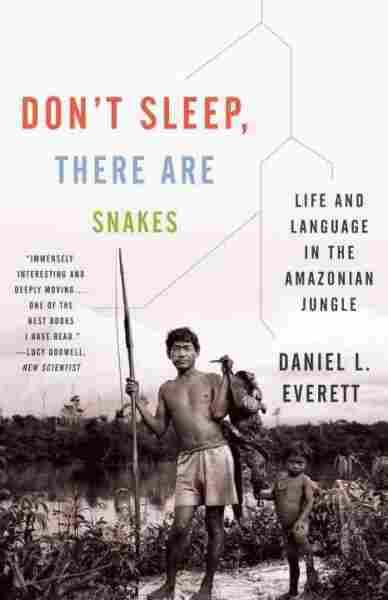 Excerpt: 'Don't Sleep, There Are Snakes' Daniel Everett went to the Amazon as a Christian missionary, but ended up spending decades living with the Piraha tribe. This book, his account of those decades with the remote tribe, is riveting, serious escapism. "Look! There he is, Xigagai, the spirit." "Yes, I can see him. He is threatening us." "Everybody, come see Xigagai. Quickly! He is on the beach!" I roused from my deep sleep, not sure if I was dreaming or hearing this conversation. It was 6:30 on a Saturday morning in August, the dry season of 1980. The sun was shining, but not yet too hot. A breeze was blowing up from the Maici River in front of my modest hut in a clearing on the bank. I opened my eyes and saw the palm thatch above me, its original yellow graying from years of dust and soot. My dwelling was flanked by two smaller Piraha huts of similar construction, where lived Xahoabisi, Kohoibiiihiai, and their families. Mornings among the Pirahas, so many mornings, I picked up the faint smell of smoke drifting from their cook fires, and the warmth of the Brazilian sun on my face, its rays softened by my mosquito net. Children were usually laughing, chasing one another, or noisily crying to nurse, the sounds reverberating through the village. Dogs were barking. Often when I first opened my eyes, groggily coming out of a dream, a Piraha child or sometimes even an adult would be staring at me from between the paxiuba palm slats that served as siding for my large hut. This morning was different. I was now completely conscious, awakened by the noise and shouts of Pirahas. I sat up and looked around. A crowd was gathering about twenty feet from my bed on the high bank of the Maici, and all were energetically gesticulating and yelling. Everyone was focused on the beach just across the river from my house. I got out of bed to get a better look — and because there was no way to sleep through the noise. I picked my gym shorts off the floor and checked to make sure that there were no tarantulas, scorpions, centipedes, or other undesirables in them. Pulling them on, I slipped into my flip-flops and headed out the door. The Pirahas were loosely bunched on the riverbank just to the right of my house. Their excitement was growing. I could see mothers running down the path, their infants trying to hold breasts in their mouths. The women wore the same sleeveless, collarless, midlength dresses they worked and slept in, stained a dark brown from dirt and smoke. The men wore gym shorts or loincloths. None of the men were carrying their bows and arrows. That was a relief. Prepubescent children were naked, their skin leathery from exposure to the elements. The babies' bottoms were calloused from scooting across the ground, a mode of locomotion that for some reason they prefer to crawling. Everyone was streaked from ashes and dust accumulated by sleeping and sitting on the ground near the fire. It was still around seventy-two degrees, though humid, far below the hundred-degree-plus heat of midday. I was rubbing the sleep from my eyes. I turned to Kohoi, my principal language teacher, and asked, "What's up?" He was standing to my right, his strong, brown, lean body tensed from what he was looking at. "Don't you see him over there?" he asked impatiently. "Xigagai, one of the beings that lives above the clouds, is standing on the beach yelling at us, telling us he will kill us if we go to the jungle." "Where?" I asked. "I don't see him." "Right there!" Kohoi snapped, looking intently toward the middle of the apparently empty beach. "In the jungle behind the beach?" "No! There on the beach. Look!" he replied with exasperation. In the jungle with the Pirahas I regularly failed to see wildlife they saw. My inexperienced eyes just weren't able to see as theirs did. But this was different. Even I could tell that there was nothing on that white, sandy beach no more than one hundred yards away. And yet as certain as I was about this, the Pirahas were equally certain that there was something there. Maybe there had been something there that I just missed seeing, but they insisted that what they were seeing, Xigagaí, was still there. Everyone continued to look toward the beach. I heard Kristene, my six-year-old daughter, at my side. "What are they looking at, Daddy?" "I don't know. I can't see anything." Kris stood on her toes and peered across the river. Then at me. Then at the Pirahas. She was as puzzled as I was. Kristene and I left the Pirahas and walked back into our house. What had I just witnessed? Over the more than two decades since that summer morning, I have tried to come to grips with the significance of how two cultures, my European-based culture and the Pirahas' culture, could see reality so differently. I could never have proved to the Pirahas that the beach was empty. Nor could they have convinced me that there was anything, much less a spirit, on it. As a scientist, objectivity is one of my most deeply held values. If we could just try harder, I once thought, surely we could each see the world as others see it and learn to respect one another's views more readily. But as I learned from the Pirahas, our expectations, our culture, and our experiences can render even perceptions of the environment nearly incommensurable cross-culturally. The Pirahas say different things when they leave my hut at night on their way to bed. Sometimes they just say, "I'm going." But frequently they use an expression that, though surprising at first, has come to be one of my favorite ways of saying good night: "Don't sleep, there are snakes." The Pirahas say this for two reasons. First, they believe that by sleeping less they can "harden themselves," a value they all share. Second, they know that danger is all around them in the jungle and that sleeping soundly can leave one defenseless from attack by any of the numerous predators around the village. The Pirahas laugh and talk a good part of the night. They don't sleep much at one time. Rarely have I heard the village completely quiet at night or noticed someone sleeping for several hours straight. I have learned so much from the Pirahas over the years. But this is perhaps my favorite lesson. Sure, life is hard and there is plenty of danger. And it might make us lose some sleep from time to time. But enjoy it. I went to the Pirahas when I was twenty-six years old. Now I am old enough to receive senior discounts. I gave them my youth. I have contracted malaria many times. I remember several occasions on which the Pirahas or others threatened my life. I have carried more heavy boxes, bags, and barrels on my back through the jungle than I care to remember. But my grandchildren all know the Pirahas. My children are who they are in part because of the Pirahas. And I can look at some of those old men (old like me) who once threatened to kill me and recognize some of the dearest friends I have ever had — men who would now risk their lives for me. This book is about the lessons I have learned over three decades of studying and living with the Pirahas, a time in which I have tried my best to comprehend how they see, understand, and talk about the world and to transmit these lessons to my scientific colleagues. This journey has taken me to many places of astounding beauty and into many situations I would rather not have entered. But I am so glad that I made the journey — it has given me precious and valuable insights into the nature of life, language, and thought that could not have been learned any other way. The Pirahas have shown me that there is dignity and deep satisfaction in facing life and death without the comfort of heaven or the fear of hell and in sailing toward the great abyss with a smile. I have learned these things from the Pirahas, and I will be grateful to them as long as I live. From Don't Sleep, There Are Snakes: Life and Language in the Amazonian Jungle by Daniel Everett. Copyright 2009 by Daniel Everett. Published by Pantheon. Used by permission of the publisher. All rights reserved.